The Tale of the Spirit of Speed is the fourth chapter in Yoshi Topsy-Turvy. Before it begins, the Spirit of Speed tells Yoshi that she hates people who loaf around and that Yoshi must collect at least six Happiness Medals to move on to the next chapter. The first part of this mission has two cannons that must be used to get over some high slopes. The second part has a few Lifts and some walls that must be climbed. The third part has some more wall climbing as well as a few Igashira-kun on rails. The fourth and final part introduces the Ball Yoshi transformation and requires breaking through some Stone Blocks using the form. The first part of this mission contains a Chime Ball that will play the Super Mario Bros. ground theme when rolling over the Chime Note. The second part has a Ferris Wheel along with a few parachuting coins. The third part has Ship Yoshi and a few Igashira-kun moving on rails. The fourth and final part takes place on a snowy mountain and requires Yoshi to slide and make well-timed jumps in order to collect the coins along the way. The first part of this mission introduces the moving cups, which have arrows on them and shoot Yoshi when the player tilts the console in the direction of the arrow. The second part has a single Lift along with a few Igashira-kun moving side to side on rails. The third part has Ball Yoshi again, but the level is much smaller than the last Ball Yoshi area. The fourth and final part contains three Wrecking Balls which must be used to break the Stone Blocks in the way. 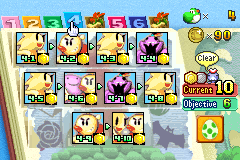 All four of the areas in this mission feature Ball Yoshi. The first part has a few Stone Blocks which are more solid than the ones before and also has some Ravens that are seen walking on the walls. The second part is a downwards staircase with more Ravens. The third part is a compact downwards area with three sets of Stone Blocks and more Ravens. The fourth part has some floating platforms with once again more Ravens. The first part of this mission has a single cannon along with some Igashira-kun on rails and a high ledge. The second part has more Igashira-kun and takes place on a snowy mountain. The third part has some rolling Igashira-kun and turquoise ground. The fourth and final part takes place on another snowy mountain and has very narrow paths that Yoshi must crouch underneath and slide to reach the end. The first part of this mission contains a few Goonies as well as a green apple. The second part has a massive Snowball which must rolled down the area to reach the checkpoint warp which is high up on a ledge as well as some parachuting green apples and Piranha Plants. The third part has a few Wrecking Balls, a Piranha Plant, and a single Igashira-kun on a rail. The fourth and final part has spikes on the sides, a few stationary Lifts, and many coins attached to balloons. The first part of this mission features rolled-up carpets, many parachuting bombs, a Yajirobē‎, and some Piranha Plants. The second part has Ball Yoshi and a few more Piranha Plants. The third part has some rolling Igashira-kun which can be used to defeat the Piranha Plants at the bottom of the level. The fourth and final part has more rolled-up carpets, Piranha Plants, spikes, and parachuting coins and bombs, which can be used to defeat the Piranha Plants. The first part of this mission has two rolling Igashira-kun, spikes, and a Big Heart. The second part contains many multicolored sliding objects and spikes. The third part takes place on a snowy mountain and has some Igashira-kun on rails and some floating platforms. The fourth and final part has Ball Yoshi and a few Stone Blocks in the way. The first part of this mission has some Goonies that must be jumped on in order to obtain some high-up coins. The second part has Ball Yoshi in a somewhat long room with many clusters of coins and Stone Blocks. The third part has Ship Yoshi along with some low ceilings and a few high slopes that must be avoided. The fourth and final part has Chime Balls that will play the Super Mario World overworld theme when rolling over the Chime Notes. The first part of this mission has multicolored sliding objects which each have four balls for each color. The second part has a few rolled-up carpets, a Fly Guy, and some parachuting coins. The third part has a single Chime Ball and Chime Note whose Notes must be used to reach the checkpoint warp at the top of the area. The fourth and final part has some more rolled-up carpets as well as a few spikes on the sides of floating platforms. This page was last edited on November 13, 2018, at 23:17.